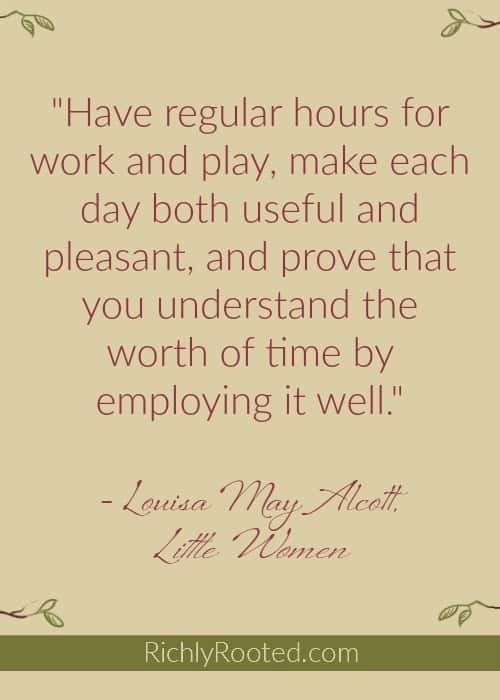 Louisa May Alcott wrote Little Women over a hundred years ago, but the novel has timeless wisdom for modern-day homemakers! 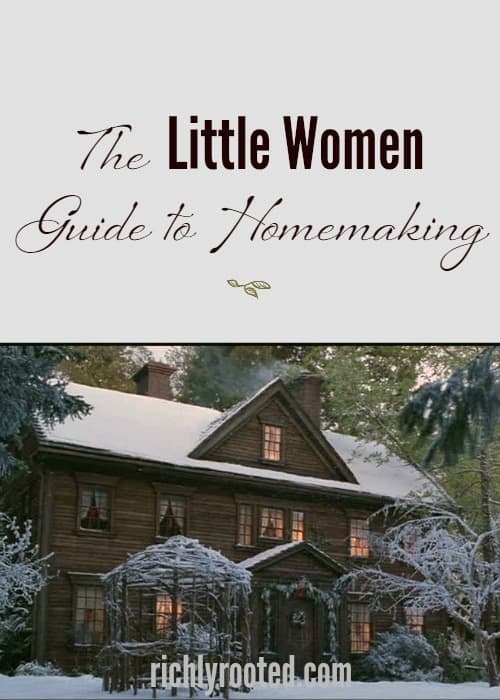 Here are 5 essential homemaking lessons from Little Women. Millions of readers will be eternally grateful that Lousia May Alcott chose to spend one New England spring writing “a story for girls.” Little Women was based on her own family, and she churned out the first volume in a matter of weeks, falling into the same writers’ vortex that she would send Jo into during the course of the novel. It’s surprisingly difficult to put your finger on what makes Little Women so endearing, as I discovered when I re-read the book this year. Perhaps it’s because Meg, Jo, Beth, and Amy are so realistic and undeniably human. The first chapter, when they complain about poverty and chores, makes it obvious that they aren’t perfect little women. But we love them for their faults, because we see ourselves in them. And as they mature and develop, we resonate with their ambition, their romance, their mistakes and triumphs, because although we live in very different time periods we live the same things. If you and I were friends in real life, we could savour tea and a comfortable conversation about why we love this book. (Thank goodness for the comments section, at least!) I’m sure talking about Little Women would lead us to discussions of An Old Fashioned Girl, and maybe on to other literary heroines like Anne of Green Gables. I would point out to you that these books are more than just excellent stories. They’re our textbooks for life. And I think you’d probably agree with me. The stories we internalize as children come back to teach us as adults. When I read Little Women again as an adult, I paid attention. What did these women have to teach me about life and love, making a home and pursuing my dreams? Because all of these things are their reality and mine, too. There are several funny incidents in Little Women where the girls attempt what today we might call “Pinterest perfect” parties, despite Marmee’s advice to keep things low-key. On one occasion, Jo, a notoriously bad cook, decides to make an elaborate meal for the family, and invites Laurie to join them. Unfortunately, another neighbour shows up as well, and the feast of underdone potatoes, overdone asparagus, burnt bread, and strawberries with salt instead of sugar becomes a standing joke. Of course Amy doesn’t listen, but discovers, as Mrs. March suspected, that experience is the best teacher. It’s a wise homemaker who knows that too much work and no play breeds resentment. But shirking your duty derails the household just as much. After the girls give themselves a vacation from housework for a week to do whatever they feel like, they discover that they all need to do their part. Here’s what my own mother taught me about hospitality, and this is why I believe every homemaker should be a hostess. Although most of us women see homemaking as our domain, we shouldn’t forget that if we’re married we’re making a home with our husbands. Meg learns this all too well when she leaves John out of the loop of household affairs and raising the twins. Her marriage and homemaking begin to suffer as a result, and equilibrium isn’t restored until she learns to respect John’s methods and input. Fill your home with music like Beth does for her family. Create simple pleasures for your family as Marmee does, and let your children develop their imaginations and feel that home is the happiest and safest haven to grow up in. I still have a lot to learn about homemaking, and I’m just beginning the stage that the March sisters are when the book ends: motherhood. But the lessons in Little Women are ageless, and I know I’ll return to them again and again, no matter the season I’m in. 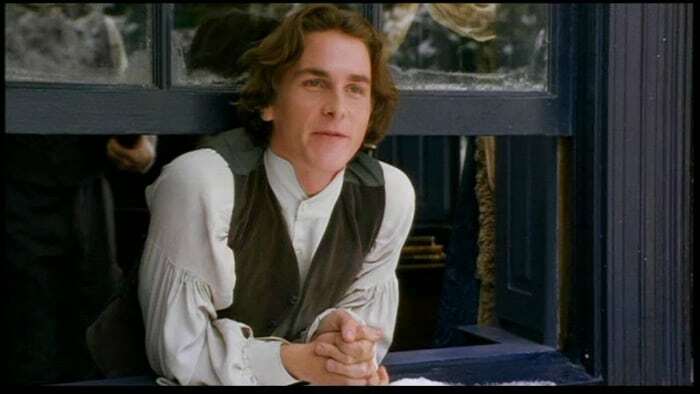 What do you love about Little Women? P.S. If you enjoyed this post, you might also like my post on how to have a Little Women Christmas! 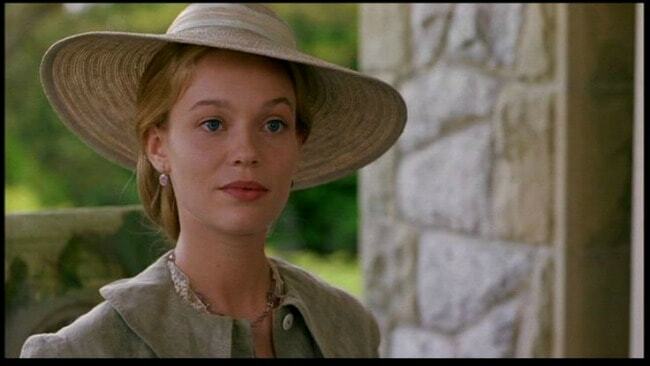 Probably the most popular movie adaptation is the 1994 film by Gillian Armstrong. The casting is excellent and it captures the story beautifully, even though it necessarily leaves scenes out and rearranges the timeline somewhat. There is also a 1933 adaptation staring Katherine Hepburn as Jo, and a 1949 version that is supposed to be especially close to the book (although for some reason it switches the birth order of Beth and Amy!). For a beautiful keepsake edition of the book, take a look at this Puffin in Bloom hardcover! I love everything about this. “Little Women” is one of those books that left a lasting impression on me in a number of ways. It is full of quality, wholesome life lessons for girls and young women, and it is so entertaining as well! 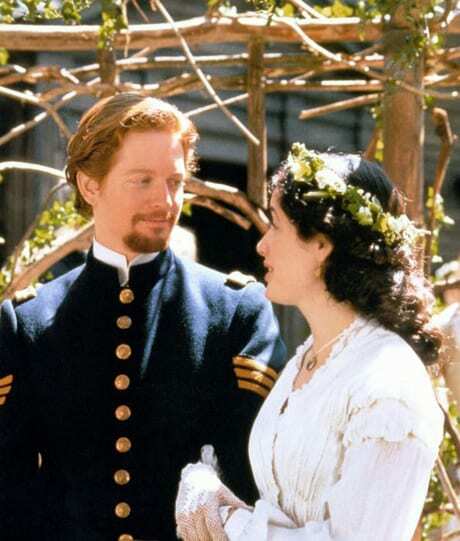 And I adore the movie adaptation; it was so well done with a wonderful cast. One of the big lessons in “Little Women” is that of contentment with one’s circumstances, while still retaining a strong work ethic and ambition. The girls all learn, each in their own way, the value of being content with what they have, whether that be a modest house, simple clothes, a small income or a less-than-Parisian nose. 🙂 And even in that contentment they are still driven to work hard and make the most of what they have. Their love and loyalty for one another and their family and friends is a beautiful thing, as well. And they are far from perfect, but when they make mistakes they own them, learn from them, and accept the consequences. I also love Austen’s books “Eight Cousins” and “Rose in Bloom.” These also contain such wisdom and good role models for young girls. Rose learns to be industrious, generous, wise, and well-learned, but she isn’t perfect either! She was a character I could relate to, as well as one I want to emulate. I think a re-read of all of these is in due order! Well said! Contentment is a huge theme in the book. And I, too, love the way that the girls own their faults and mistakes. I really want to re-read the Rose books, but truth be told there are still some Alcott novels I haven’t even read yet, so I’ll probably read them first! Great post. I always enjoy these kind of reminders; prods toward the homemaker, wife, and mother I want to be. I have always loved this book (and the movie as well!) and always felt a connection with Jo’s character! I feel even more of a connection now, as I’ve just had my 4th daughter! We have a house of our very own little women, and I have the sometimes daunting task of raising them all. It’s a blessing, and I want each day to be sunshine and blessings too. Thank you for the encouragement and reminders! I love this post! I think a re-read of the book and re-watch of the movie is definitely in order. ? What a great way to apply the lessons to our lives as homemakers! Thank you for sharing this, you have inspired me to pick up Little Women again after not having read it in over a decade (though I did just read Anne of Green Gables for the first time recently!) For the record, I did have to dig in to your blog to see where you live because I would have loved to have tea and discuss Little Women, literature and homemaking! Unfortunately we are much to far apart as I am up north in Montana. 🙂 I will have to settle for the comments section and reading more of your posts online. Have a wonderful day! It’s nice to meet you, Lacey! We could’ve been in Montana–my husband applied for a job in Butte at one point! It’s a beautiful state. I’m glad you read Anne of Green Gables. Little Women helped to pave the way for novels like Anne, because it changed the way that girls’ stories were written. Prior to Little Women, many of the girls’ books of the day were more didactic and moralizing. Little Women had real girls, with real faults and ambitions and character quirks. The public loved the March sisters, and later, Anne! I hope to “see” you more in the comments, and I’m glad you’re here! 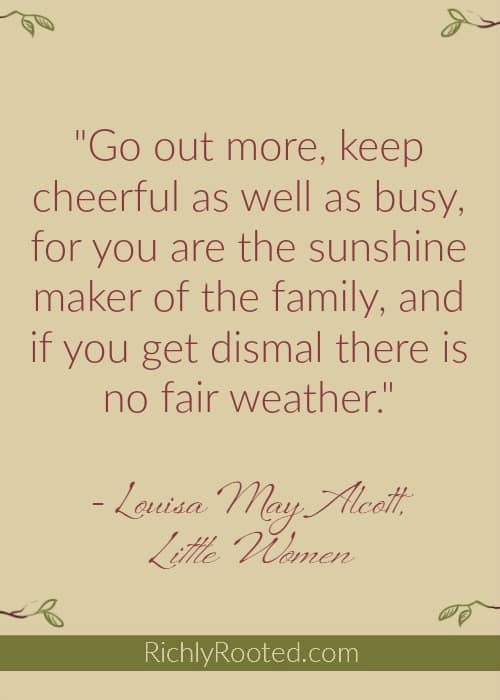 Alcott wrote a whole lot more about the March family following the events in Little Women. Read the rest of the books, you’ll be glad you did! I want to! I have read several of Alcott’s other books, but for some reason never got around to the other three March novels! Thank you for the recommendation. Thanks Lauren! I’m glad to have you here! I love that books like Little Women can speak to us at different stages of life–always fresh! I haven’t read a good LMA bio, but I do have one on my shelf called Invincible Louisa that I’m planning on reading this summer. So far, what I know of LMA’s life I’ve gleaned from the introductions to her books and from visiting Orchard House while on my honeymoon. And six younger sisters? How fun! I bet you felt a lot of responsibility growing up, though, as the oldest! My favourite book when I was young. I actually named one of my daughters Meg. Thanks for the post! You’re welcome! It was fun to write. I’ve always loved the names in Little Women, too! It makes me wonder what Marmee’s name is. Does Alcott ever tell us that? I don’t think so! Marmee is called Margaret as well! Beth mentions it when she’s embroidering the handkerchiefs and I think Aunt March does at some point too! Have you seen/listened to the musical? I forgot her name is Margaret! That’s neat! I’ve never seen a musical for it, although I did read the part of Amy when I was auditioning for a different community play! I would love to see the musical some day! Oh good! I’m so glad you read it with tea!! That’s perfect. Vintage does age well, indeed! This is my first visit here. Loved this post. I love Little Women and I agree with what you shared. I love the name of your site as well. You have inspired me to read this book for I have only watched the movie. Thank you so much for leaving a comment, Chrissy, and welcome! Definitely read the book. It is so good and it’s very easy to follow and become immersed in the world of the characters! I love, love, love this!!! Made my day! I’ve just been married a little over a month ago and am now collecting all sorts of notes on homemaking :). Little Women is one of my absolute favorite novels and not only do I want to read it again with a cup of tea, you’ve given me much needed inspiration! Thank you so much for the lovely post!! Elyssa, you are most heartily welcome! Congratulations on your wedding, too! I, too, love Old Fashioned Girl and many books by L.M. Montgomery! Re-reading them as an adult, I’ve learned just how much wisdom I can glean from them today! I do enjoy how you use your love for reading classics to apply timeliness wisdom to today’s home making tasks! You are a blessing! Thank you! There is so much gold in these old books! 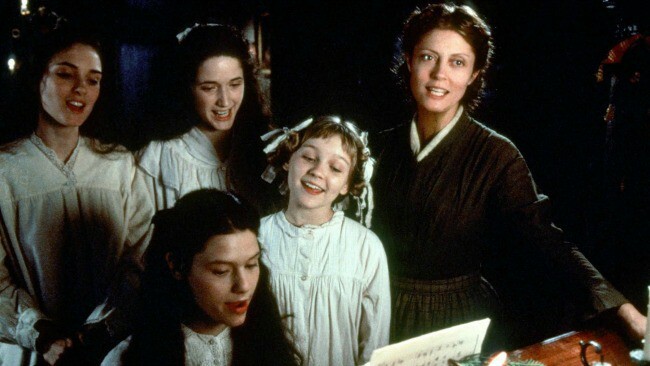 I love Little Women because it was Marmee who taught me how to be a real mother. I read this book several times when growing up, and Marmee impressed me with her kindness and love along with her practical moral lessons. My childhood was a sad one,and I wanted to give my future children a happy one,so I paid close attention to all that Marmee did. My 5 children are grown up and have little ones of their own now. Each of them, at one time or another, have thanked my husband and me for giving them ‘”the best childhood ever'”. Thank you,Marmee! That is a neat story, and lovely to hear how you began a new and better legacy for your family. I love how books can be friends and teachers to us. To me, reading books like Little Women isn’t just a recreational, mindless activity. They truly enrich my life and inspire me in practical ways! Thank you for your comment!